If you have an iPad that has screen damage, don't panic! ﻿Cell Phone Repair Mission Viejo﻿ can help. We all have accidents. We put our iPad's in our briefcases, suitcases and purses that are often thrown around. They get smashed and squished and our iPad screens get cracked or shattered. No need to stress. Give us a call for a free estimate for your iPad repair or fill out the form. Did the school issue your children iPad's? It seems like a great thing, but they get dropped and kids forget they need to treat them with care. Don't worry about turning in a broken iPad, simply stop by or give us a call. Our certified technicians will diagnose the issue and get your iPad repaired in no time. We understand that you don't want to trust just anyone when it comes to fixing your iPad. It is expensive and used almost as much as your cell phone. 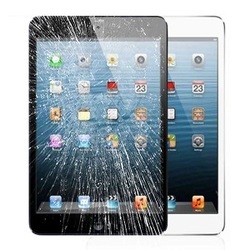 Our professionally trained pros will handle your iPad with the utmost care. Cell Phone Repair Mission Viejo will also provide the best solution at the best price. Our replacement parts are original. We do not get parts at a cheaper price from China that break 2 weeks later. Check out information about our parts and warranty HERE. Call Cell Phone repair Mission Viejo for any of your iPad issues. Our caring technicians will listen to you describe the problem and provide you with a free estimate. Our prices are the best - give us a call today! iPad repair needs in Mission Viejo, Ca today!